Questoverseas: This Years Red Nose Day - Climbing Kilimanjaro?! Radio 1 DJ Chris Moyles is set to climb Kilimanjaro in 3 weeks time with a host of other celebrities including Gary Barlow and Cheryl Cole. The high profile event has been organised to raise money for a Comic Relief campaign aimed at preventing the spread of malaria through the use of mosquito nets. You can find out more about the challenge on the "Red Nose Climb" website. At 5,895m Kilimanjaro is the World's highest freestanding mountain and to reach the summit usually takes a grueling 5 days through tropical forest to arctic conditions on the Uhuru Peak. Good luck to them!! 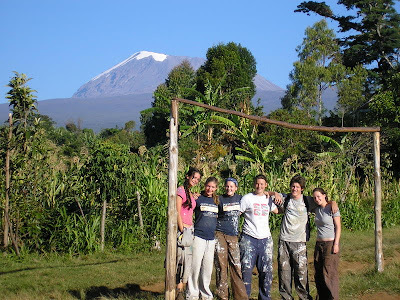 The photo above was taken at Quest's previous Tanzania project site in Marangu, at the base of Kilimanjaro. Here groups completed the building of a nursery school, library, a 3 storey accommodation block for the Vocational Training Centre amongst others. Our project has now moved to the more arid lands further south in the Manyara Region. The focus here is to create high quality schools that can provide the free education that the children of Tanzania deserve. The school we are currently working on has a fully functioning sustainable organic farm which both teaches the children farming techniques as well as providing an income for the school and local community.